You've never seen boxing movies quite like this pair from the late Jamaa Fanaka. 1979's Penitentiary and 1982's Penitentiary II may be worlds apart in terms of budget and execution, but both bear the mark of an artist struggling to shape his revolutionary ideals into entertaining cinema and he managed to do so pretty well, at least in the case of the first film. A couple of years ago Connecticut based indie home video label Vinegar Syndrome announced a deal partnering them with Xenon Films to release a number of classic black action films including the major works of Rudy Ray Moore, along with the available films of Fanaka. This is the first output from Fanaka as part of that deal and it all looks better than ever. Check out the overviews below for more details. Penitentiary is fearless filmmaking from a director who gave no shits about sanitizing his vision for the masses. Jamaa Fanaka was still very much in the fight that many in the black filmmaking community had moved on from in 1979, years after the death of the Blaxploitation boom. He'd already made a couple of low budget features, but Penitentiary was the one that made him a force to be reckoned with. Utilizing themes that sadly remain relevant to this day, Fanaka painted a portrait of a world in which Black Americans have the chips stacked against them at every turn, and wrongful imprisonment isn't the exception but the rule. Forced to brutalize one another for the entertainment of the power structure, Penitentiary is a metaphor for the Black American experience unlike any other. Exploitative and intellectual all at the same time, it remains a masterpiece. Martel Gordone is just a brother minding his own business trying to get a little but further on down the road when he's picked up by a beautiful young woman while hitchhiking. The pair quickly hit the sheets as a way of passing the time, but things quickly go south when they make a stop and all hell breaks loose. In an unexpected kerfuffle, a white hooligan is killed and while Gordone is defending his lady, and he's convicted of the crime and sent up the river. Once inside the jail he finds that society and civilization are all but lost as the Pen has its own ideas about what passes for good behavior. Martel is shacked up with a crazy eyed prisoner named Half Dead who takes a liking to his fresh meet cellmate. When Martel rejects Half Dead's advances, the two go at it and a blood feud begins. When the prison power structure sees the kind of fighting prowess Gordone has, he's wrangled into stepping into the boxing ring for the entertainment of the guards and the warden. If he wins the annual tournament against the reigning champ Jesse "The Bull" Amos, Martel "Too Sweet" Gordone has a chance of getting out early, but it's not going to be easy. Packed with political poignance and blunt treatises of the state of Blacks in America, Penitentiary is a cornerstone of Black revolutionary cinema on the same level as films like Sweet Sweetback's Baadasssss Song and Do the Right Thing. The fact that it's only been familiar to exploitation fans for decades is almost as much of a criminal act as the incarceration of Too Sweet, himself. Thankfully Xenon and Vinegar Syndrome are here to right the wrong that has been done to the film by providing it with a new lease on life. We owe it to Fanaka to spread the love. Penitentiary comes to Blu-ray in a gorgeous new 4K restoration from Vinegar Syndrome that blows all previous releases out of the water. The film is gritty and real, with blood, sweat, tears, and grime oozing from every frame. Vinegar Syndrome's release plays tribute to all that work with some heavy duty work of their own. The new transfer is excellent, with fine detail bursting from the screen and a wonderful filmic texture. The audio is quite solid as well, supporting the dialogue, effects, and score handsomely. All in all another great A/V presentation. Vinegar Syndrome brings a healthy number of extras to the table with Penitentiary as well. Sadly, Fanaka passed a few years ago, but he is represented here by an archival audio commentary that is very informative, there is also a second commentary from 2nd AD Sergio Mims that offers even more context. In terms of interviews, we get one with star Leon Isaac Kennedy (Too Sweet), cinematographer Marty Ollstein, and producer Alicia Dhanifu, all of which have their own value in adding to the contextualization of the film. I really enjoyed the Kennedy interview as he and Fanaka seem to have seen the story and character of Too Sweet very similarly, the interview also talks a lot about Kennedy's career before and after Penitentiary. 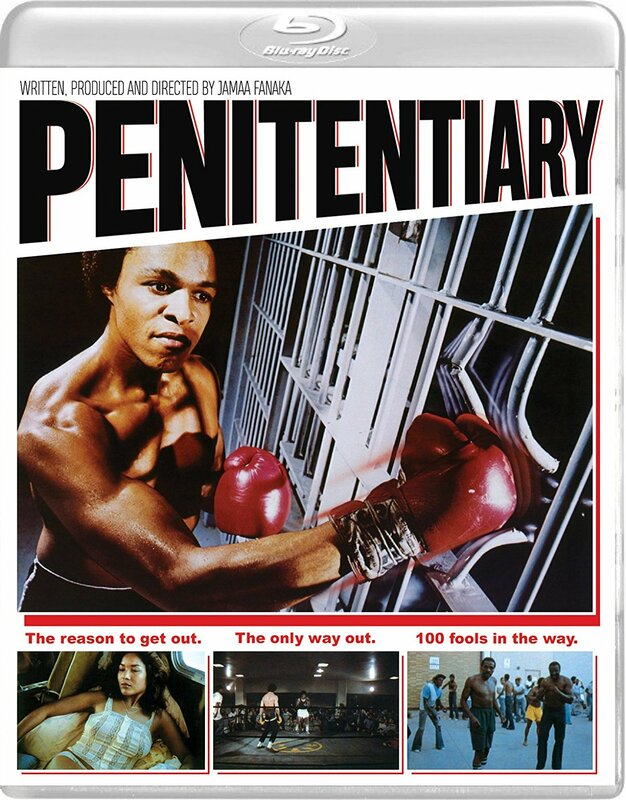 Penitentiary is not only a great film, it's an important one, and Vinegar Syndrome has more than done it justice. Definitely recommended. The first Penitentiary film was a blockbuster success when it released, and so it was only a matter of time before Jamaa Fanaka went back to the character of Too Sweet Gordone to further explore his story. In Penitentiary II however, the stakes were now higher for both Too Sweet and Fanaka, and a number of changes took place, some better than others. With the success of Penitentiary, producers were now willing to spend some money on the sequel, and as a wise man once said, "Mo' Money, Mo' Problems", in this case that meant more meddling by producers and complete recasting of all the major roles apart from Leon Isaac Kennedy himself. Half Dead was now played by Ernie Hudson, and for some reason Mr. T enters teh picture as Too Sweet's new trainer. In spite of the demands of a bigger budget, Fanaka manages to insert his own political views into this out-and-out entertainer as the action goes from overly political to over-the-top goofy in some cases. However, Penitentiary II still has a story to tell about the historical and contemporary condition of male Blackness in America, it's just a matter of whether or not the audience looks in the right places. When Too Sweet is released from prison following his win at the tournament against The Bull, he decides it's time to settle back into normal life and moves in with his sister and her husband. Unfortunately for him, while he may be done with the past, his past has a few more tricks up its sleeve for him. As a condition of his release he is supposed to be working for a boxing promoter on the outside, Too Sweet resists until his old nemesis and horny cellmate Half Dead escapes the Pen and kills his professional roller skater girlfriend Clarisse. Too Sweet has no choice but to get back in the ring, this time with Mr. T in his corner as trainer, and fight for his freedom and his life in Penitentiary II. All of the action is cranked up to eleven in the sequel, and as I mentioned above, the increased amplitude threatens to drown out the subtler political aspects of the film. However, Fanaka seems to find it to be his responsibility to make some noise about the dreadful conditions and involuntary servitude of his brother and sisters with all of his work, and so if you go in looking for depth, it's definitely there. While I prefer Penitentiary the first for it\s more overt, forward-facing political aspects, it's hard not to enjoy a film as crazy as Penitentiary II. This one is definitely a lot of fun, recommended. 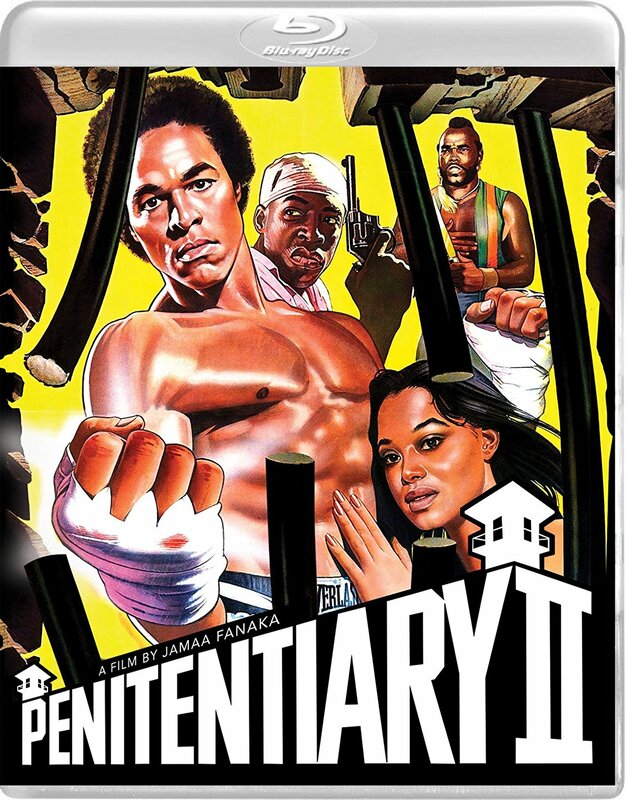 Vinegar Syndrome's release of Penitentiary II is even better looking than the first. It's amazing what a few million extra dollars will do for the production value of a film. The 4K restoration of this sequel is outstanding, leaving all previous home video editions in the dust. Much like the first, all of the characters in Penitentiary II seem to be covered with an eternal and unyielding layer of dirt and sweat and this new release lets the view count every speck of dust and every bead of sweat. Just beautiful. The extras on the sequel are fairly similar to those on the first film. We get another archival commentary from Fanaka, as well as a wonderful video interview that spans almost 30 minutes with him talking about the film and his career. It's great to see him and the energy he had to speak about his work even until he grew frail towards the end of his life. We also get a continuation of the interview with Kennedy from the first film in which he extends the discussion of the films, their impact, and the changes made from the first film to the second. It's a great, honest, and informative interview that's definitely worth checking out. Jamaa Fanaka was one of the great filmmakers who definitely deserved a lot more attention than he got. Thanks to Vinegar Syndrome and Xenon for making these new definitive editions of his work a reality.